CELEBRATING 50 YEARS OF BACKYARD FUN! SPA REIMAGINED. THE FUTURE IS NOW. BEST TIME TO BUY, BUILD & SAVE IS NOW! 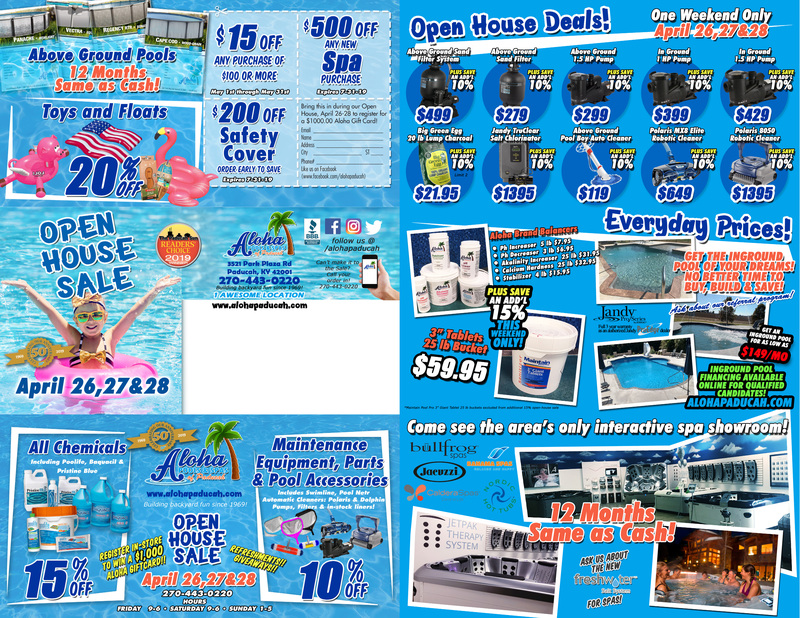 Welcome to Aloha Pools & Spas! Did you know we've been around since 1969? We're also local and family owned and operated. After 50 years and thousands of pools, we're still makin' a splash! Located in Paducah, we're your backyard experts when you're thinking about a swimming pool, spa, hot tub and/or sauna! Let us transform your backyard into your family's very own oasis! Awesome deals... all the time! Browse our selection of inground pools! We welcome you to browse our above ground pool models. We have each pool on display at our store! Over 40 spas and hot tubs in stock and on our showroom floor everyday! We have tubs for every budget from Bullfrog, Jacuzzi, Caldera, Bahama & Nordic! Grills, furniture, game rooms and more... Come on in and check out our store! Browse our selection of Finnleo saunas.